After sharing the renovation details of our bathroom, many of you asked for the same information for our kitchen, so I thought I’d dedicate a post to our kitchen renovation and the design decisions we made. Designing our kitchen was one of my favourite parts about our renovation. Because we’ve designed a kitchen before — in our last house in London, I have a bit of experience under my belt. I’ve also learned what I like and what I don’t, what works and what doesn’t. 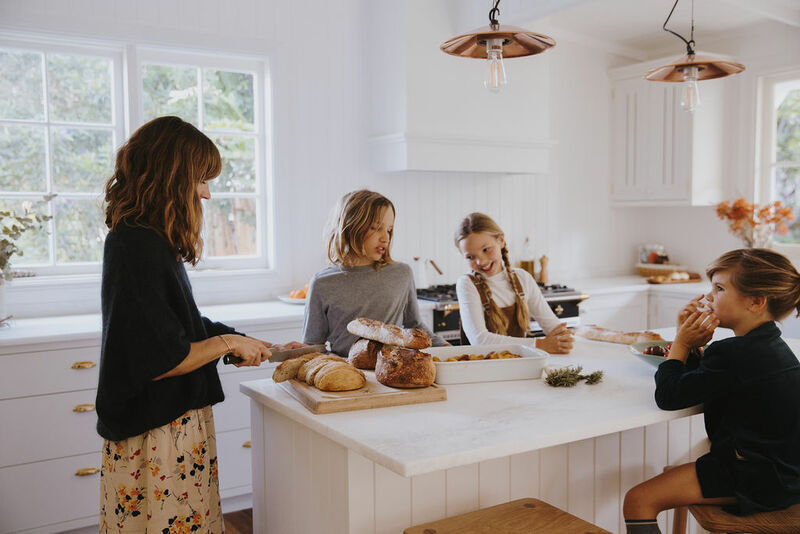 Kitchens are the heart of the home; at least this is the case in our family. We are always in the kitchen. We knew that when it came time to make budget compromises with our renovation, the kitchen is the one room in the house we didn’t want to skimp too much on. I began by looking on Pinterest for kitchens that inspired me and looked like they would suit our old home. I created a board to collect ideas, and in the end I was most inspired by this kitchen and this kitchen. I also spotted this photo (which happens to be a photo of my friend, Natalie Walton’s kitchen in her last home), and knew I wanted to incorporate a spice jar shelf like that. In general, I knew I wanted a more traditional-style kitchen, one that would look like it’s always been in our home. This helped keep me focused when buying taps, appliances, lighting, etc. I knew, from our last home in London, that I love the shaker-style type of kitchen with painted wooden cabinetry. I also remember admiring the UK-based kitchen companies, Plain English and deVOL. When I discovered this kitchen on the deVOL website, I knew I wanted to incorporate the same combination of brass pulls and painted wooden knobs. 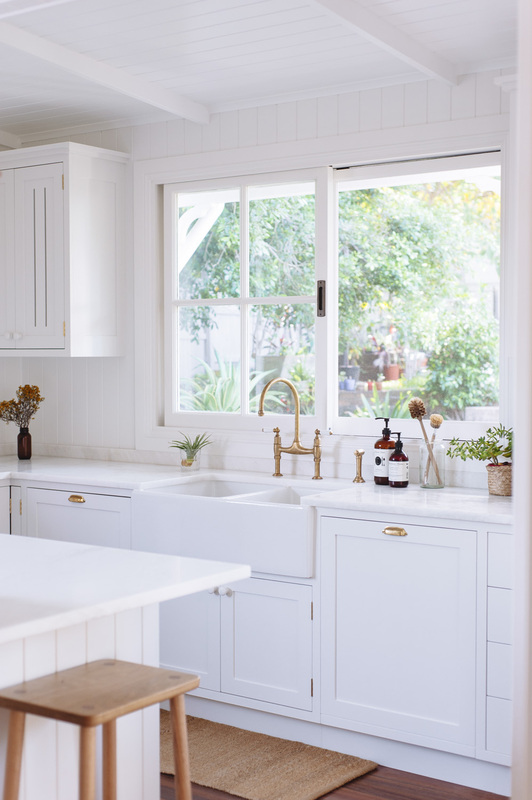 I love the simplicity of the wooden knobs, and liked that it didn’t make the kitchen look too fancy or shiny. So I had a good idea of what I wanted, and it was only a matter of finding someone to make it. Finding a kitchen company or joiner to make this style of kitchen here in Australia proved to be a challenge. It became apparent that this type of kitchen, while more common in the UK, is not very typical here in Australia (perhaps too old-fashioned?). When I used the term ‘shaker-style’ with various kitchen companies, no one knew what I meant. It was a challenge to simply find a kitchen-maker who saw my vision. Then, a friend recommended David from D Hinged Kitchens, and I was so thankful he was interested in our project and up for the challenge! I met up with David several times to go over the details of the joinery, and I was appreciative that he was as obsessed with the tiny details as I was. 🙂 For example, I had spotted this photo on the Plain English Instagram account, and knew I wanted to incorporate similar grooves in our wall cupboards. I also wanted exposed brass hinges, an integrated rubbish bin and dishwasher hidden behind the joinery, pull-out drawers within cupboards for pots & pans (similar to this photo), etc. Essentially, I printed up a lot of specific design photos and shared my vision with David, and he was thankful for the guidance and attention to detail. While I drew the basic sketches and outlined where I wanted everything to go, our architect, Fiona Gibson, created the detailed drawings. 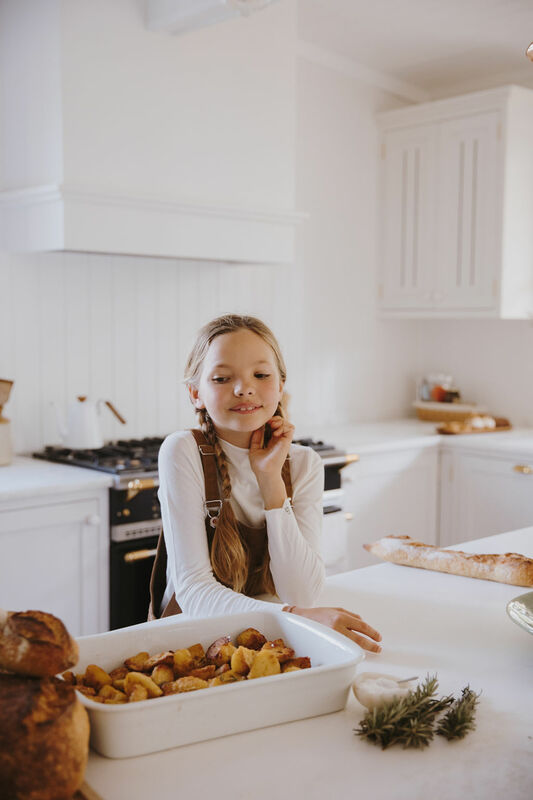 While I think you could probably renovate a kitchen without architectural plans, it makes it so much more of a seamless process to have them, and easier for the joiner too. The joinery was all done by David Harris of D Hinged Kitchens, including the pantry shelf unit to the left of the fridge and the shelving within our enclosed pantry. We are so happy with how everything turned out. We splurged and bought the range cooker of my dreams. I’ve long admired the Lacanche cookers, and when I called to enquire about timing and delivery, they told me that if I placed an order that week, I’d be able to make the September quarterly delivery from France. Something about the urgency of placing the order enabled me to stop overthinking and just commit. It’s a huge investment, but it’s one of my favourite things about our kitchen. While we weren’t prepared to invest in Perrin & Rowe tapware throughout the house, we decided to splurge on the kitchen tap. We figured it’s the one tap that will get used all day long, every day, so it was worth the splurge. It was also one of the only options for a traditional-style bench-mounted brass tap with separate spray rinse. (Opting for the brass finish definitely limited our choices). We bought ours from The English Tapware Company based here in Australia. The Belfast sink is from BelfastSinks.com.au. I always like a big sink with a centre division. It’s nice when doing dishes to have one sink for clean dishes and one for dirty, or one for doing dishes and the other side for washing hands, etc. I loved our Carrara marble bench tops in our London kitchen, but when it came time to choose a marble for this kitchen, I kept finding myself drawn to something warmer in colour. We discovered ‘Blanc Marble’ at Finestone Granite & Marble, and liked that it is overall whiter in appearance and the streaks are more of a warm grey and light brown than a colder grey. It’s slightly more expensive than the Cararra Marble, but we are so happy with the decision. For the drawers, the dishwasher pull and the bin pulls, we opted for the classic cup pulls in unlacquered brass finish. We ordered all our brass cabinet knobs and pulls from House of Antique Hardware in the US, and we’re so happy with the quality of it all. The other cupboard knobs in our kitchen are simple wooden knobs painted the same colour as the cabinets. The walls in the kitchen are painted the same as the rest of our home: Natural White by Dulux. For the kitchen joinery, we simply opted for Natural White in double strength. (I had no clue you could do this with paint colours. You can double strength any colour for a richer version. You can also opt for quarter or half-strength colours, for paler versions. I will admit that having these options gave me a minor panic attack in the hardware store when faced with all the options, but I’m so happy with the result.) Because we chose the double-strength of Natural White, the walls and cabinetry compliment each other so well. There’s enough of a contrast, but it’s so subtle. 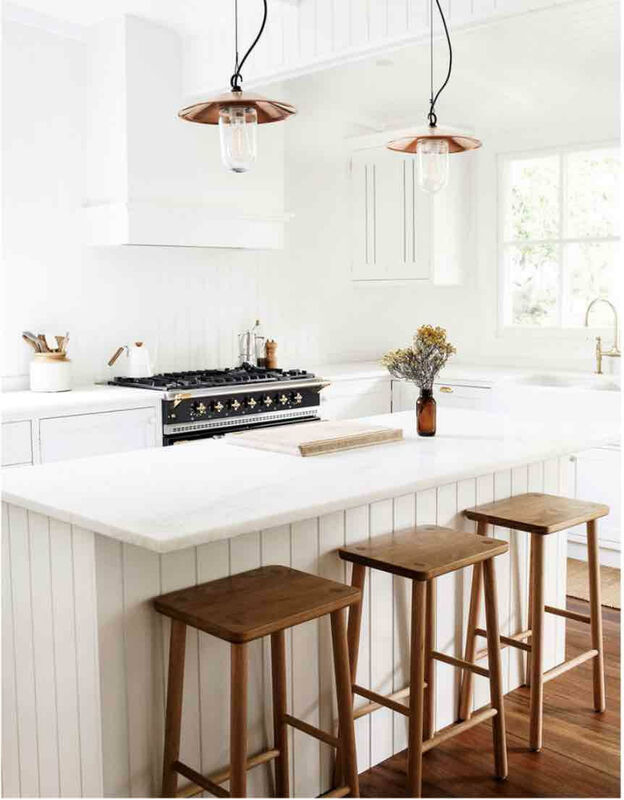 The pendant lights above the island bench are the Chelsea Pendant Lights from Dunlin Home. We had several pendants in our London home from Original BTC and we were so happy with them. When searching for Original BTC lighting here in Australia, I discovered Dunlin as the Australian distributor. We now have several lights throughout our home from Dunlin and the quality is amazing. 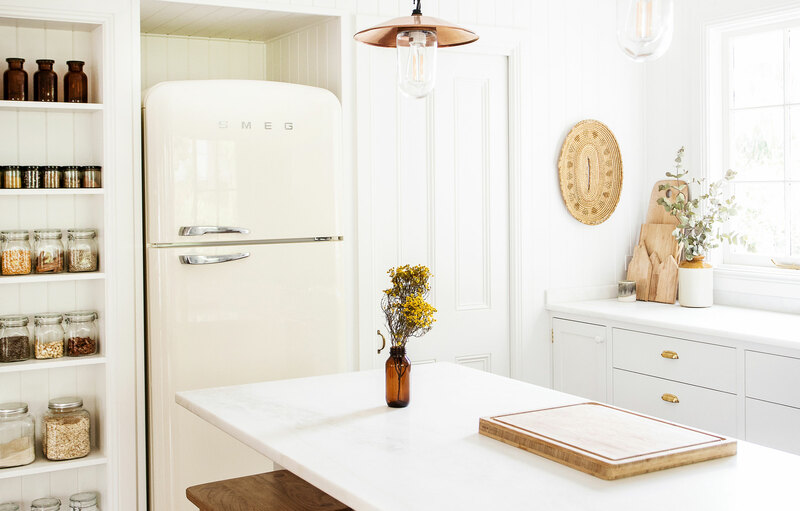 We love the retro look of the Smeg fridges and couldn’t resist buying the cream-coloured FAB50. I will admit that this was a purely aesthetic decision, as the fridge itself is not known to be the best quality, but it sure does fit nicely in our kitchen, and so far we have no major complaints. The spice jars on our shelves are from Stow & Co, a local company offering sustainable, zero-waste pantry storage options. We got the Stow Complete Pantry and are so happy with the quantities of jars, etc. We bought our bar stools from our good friend, Jeremy of JD.Lee Furniture. Jeremy makes all his furniture by hand in his local workshop using sustainable wood and materials. It was another investment, but one we are so happy with. The photos above were taken by Kara Roselund for The Design Files and Amelia Fullarton for Bellerose. All so beautiful and a really helpful post to someone who has been trying to plan a kitchen for a year and is struggling to commit!! Sometimes Instagram inspiration makes it harder!! Where can I find your bathroom renovation post? What are the dimensions of your center island? What is the distance between the island and the wall counter? In terms of design, have you learned any “what-not-to-do” lessons? Oh, and is that space above the fridge intentional and will you fill it with something? I haven’t learned so many ‘what-not-to-dos’… but here are a few things I have learned. 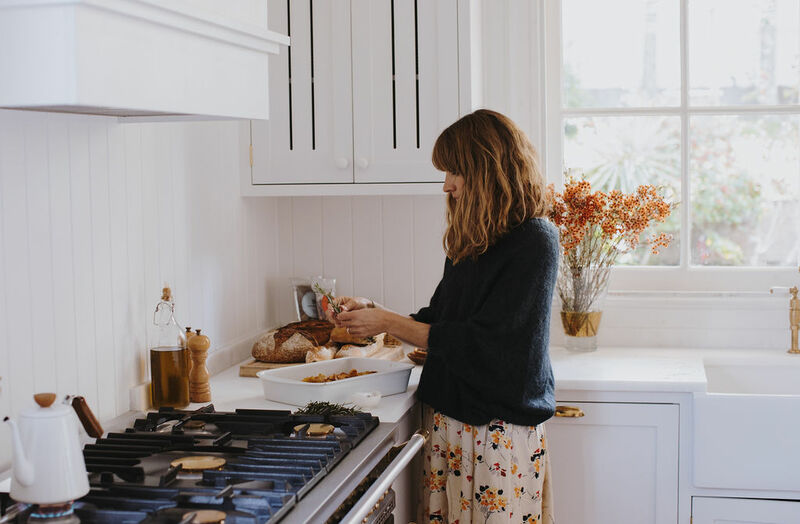 Most builders try to talk you out of using wooden floors in your kitchen, but we’ve never had a problem and love that wooden floors are easier to stand on and more forgiving if things are dropped. I also love the natural element and warmth of a wooden floor. Many people also try to talk you out of using marble on the bench tops, but we’ve never found it to be as high maintenance as people say. I’ve learned that I personally love symmetry in the kitchen — so I love having a kitchen sink centred on a window, or centred in an island (for example), and then I like to have the space on either side of the sink symmetrical. You’ll see in our current kitchen that we matched the bin cupboard to the dishwasher on either side of the kitchen sink. We also matched the wall cupboards. I just think it’s really pleasing on the eye when things are symmetrical like that. Most people tell you that you have to have a tile splash back behind your range cooker. We didn’t put tile behind our cooker in this kitchen (we did do it in London), and we haven’t regretted that decision. I like the simplicity of the walls remaining the same throughout that kitchen elevation. It’s beautiful, Courtney! Could you share where you found your bridge faucet? I’m currently on the hunt for one and the only one I’ve found that I love so far is crazy pricey! Thank you! The gap above the fridge was intentional — we were hoping the top of that nook would match the top of the spice shelf to the left and the top of the pantry door to the right. In the end, it’s slightly higher, which was a building mistake. We are considering adding a shelf above the fridge to make use of that space, but just haven’t gotten around to it yet. Courtney – do you have another, hidden pantry with boxes of cereal and baking powder and stuff like that? 🙂 I would worry that I’m not cycling through the products in the jars. Such a lovely kitchen, thanks for sharing. Thanks for your post, I always love hearing the details of my favourite kitchen designs. I found your comment interesting about the difficulty you had finding shaker style kitchens. They are everywhere here in Sydney, particularly in the suburbs on the North Shore where I live. It tends to suit all the old style homes found in this part of Sydney. Such a lovely kitchen. Thank you for sharing the details! I would love to hear about your experience with marble countertops. Do you find they get stained or etched, especially with children around? And did you have yours sealed? Thank you for the tour of your beautiful kitchen! I wonder where you keep all your groceries? I have more than double the amount of fridge and freezer, but l still lack space. How do you manage? I should have said in this post! We have a small walk-in pantry, just to the right of our fridge. It’s where we keep all the groceries, cereal boxes, pastas, sauces, etc. And because of the height of our ceilings, the space goes up quite high and is plenty of space. We used low sheen finish on walls and semi-gloss on trims. And I believe we used the same semi-gloss on the kitchen cabinets. Hi Courtney, this is my dream kitchen 😍. 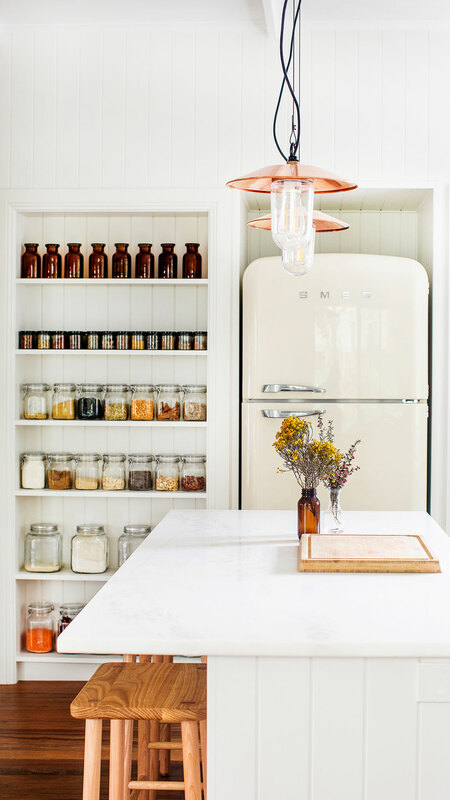 Just wondering where you got your brown jars at the top of your pantry shelving? What a great kitchen ! Well done . So white and fresh but warm with wooden floors and other details . I really like it. Love the containers for your flour etc and your honesty about your fridge. very generous to give so much detail. Thank you . We painted our ceilings with Dulux Vivid White. But all doors and trips and woodwork was painted in Natural White, but in a different sheen level. I believe walls were painted in low-sheen, and trims were painted in semi-gloss. I believe it’s the aged brass — definitely not polished!